Reevaluate reinforcement and the reinforcers currently being implemented (on purpose or by accident). Determine if positive (appropriate) behaviors or negative (inappropriate) behaviors are being encouraged. Reinforcement, an ABA term, can be either positive or negative. However, be sure to think of these terms (positive & negative) in "math" terms (add and subtract vs. appropriate and inappropriate). This is very, very important to avoid confusion. A reinforcement procedure is "only" a "reinforcement procedure" if the behavior is increased - it is repeated in the future. For example, if a child screams and then receives something desired (i.e., candy, cookie, being held, etc.) then, in that situation screaming worked! The child was positively reinforced. In the future, when the child encounters a similar situation, he or she screams again to gain access to a desired item... it worked before. This is an example of "positive reinforcement" - the individual gained (positive) a reinforcer (i.e., candy) by demonstrating the behavior of screaming. The behavior of screaming increased... the child used it again.. and possibly again and again if it continues to work for them. If the child screamed and something the child did not like was removed (i.e., a demand to sit at the table, holding the child's hand, etc.) then the child will scream again in the future if he/she wants the similar item or request to be removed. This is an example of negative reinforcement. 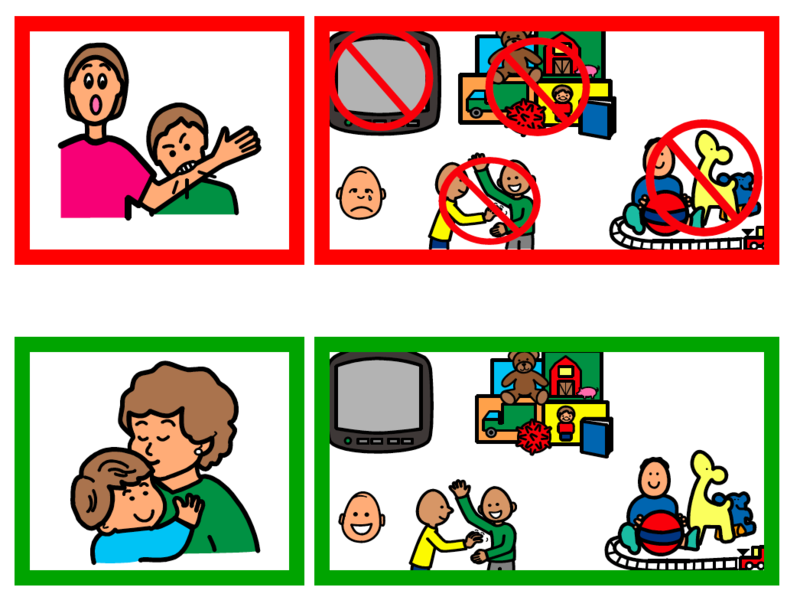 It may be helpful to place visuals in front of individual to help with clarification - or a choice board. It may surprise you, but an individual's reinforcer may actually be something most individuals attempt to escape. It could be performing in front of others... completing all homework before leaving school.... being in class to receive all assignments... etc. For example, if you could gain a "free steak dinner" - assuming you love steak - but in order to receive this wonderful, free steak dinner, you must first complete a twelve week training course on reinforcers, then it probably wouldn't be worth it. If you needed to answer a 12 question survey - no strings attached, then it might be worth it. Or, instead of a "steak dinner" after you completed the 12 week training course, you received an "all expense paid" vacation to Italy - with someone managing your household and business while you were away. Then..it may be worth it. Remember, we are all so very different with different likes, dislikes, personalities, responsibilities, strengths, and challenges. All of these can be factors when determining reinforcers. Bottom line.. why work for it if it is already yours or if it is at your disposable anytime, anywhere, etc. For example, if you like Hershey's chocolate candybars and you received a "rectangle" piece each time you said, "thank you", after 30 or so "thank you's".. you may stop saying "thank you" or avoid the individual trying to give you a piece of chocolate - you may even get sick) Satiation is the term that refers to "too much of a good thing" - no longer effective. Think lightbulb - if you need a picture or something to grasp - I know I do. For example, if an individual wants to make a room brighter, then the individual adds the light - by flipping the light switch to the on position - and the lights are on.. it is brighter. So, next time when the individual "wants" the room to be brighter.. then he/she will add light by flipping the light switch on. On the flip side..., if a room is "too bright"... an individual can turn off the light (remove/subtract something that is aversive or bad - to that individual at that particular time) and the room is less bright - dark (the reinforcer- or event that encourages the use of the behavior again). The aversive or unwanted light is gone/removed (negative - subtracted) due to the behavior of turning the light switch to the "off" position. Therefore, the removal of the light's brightness (the reinforcer or event following the behavior) encourages the continued use of the behavior (turning off the light switch) when it is too bright. In both situations... turning "on" and turning "off" the light switch continues to occur in the near future - behavior increases. Reinforcement has occurred in both situations because the behaviors increased (or repeated) for that individual. Therefore, it is so important to keep a close eye on what could be encouraging the repeated use of challenging behaviors.